Scientific Name: Dolomedes tenebrosus spider is a member of the Pisauridae family, known as nursery web spiders They do not build webs. Size and Identification: Large spider brown. Habitat: These spiders are common in forests and meadows, especially near streams and creeks where they wait for passing prey on rocks and pebbles at the water's edge. Fishing Spiders are always found where there are lots of plants, both in the water and on the shore where they hide from predators and ambush prey. Found in the eastern half of the U.S. and Canada, from New England and adjacent portions of southeastern Canada, south to Florida, and west to South Dakota and Texas. Economic Importance: All the fishing spiders are considered beneficial, as they keep insect populations down within their spheres of influence. Their bites are not particularly troublesome. Feeding Habits: Feed primarily on aquatic insects. They will also prey on terrestrial insects and will also capture and feed on small fishes and other small aquatic organisms. Their meals are often land insects that have fallen in the water and can't escape, but they eat aquatic insects too. Insight: People who live close to a wooded habitat may see fishing spiders that wander into their homes from time to time. This can be frightening, especially since the spiders are sometimes very large. 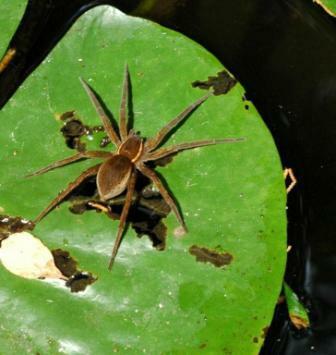 Although fishing spiders are big enough to give a painful bite, they are not considered dangerous.